Lynn’s DnD character is… peculiar. She’s an Elf cleric that is played totally naive and gullible, but incredibly lucky. She gets bonuses to some rolls just for her blind luck, yet she has negatives to insight and perception. Because she’s so naive and gullible, when she is in the group, the party gets a bonus to their perception, just on the fact that they are constantly scared of something bad happening to her. Her deity speaks to her and she has named it Pip Pip and she’s obsessed with shiny things. I’m going to go through the Audio from last weekends DnD session and post some of the Funnier bits to the web. There may also be one more DnD comic in the near future. In other news, I’ve recently joined forces with the wonderful lads over at HATEFARM (Very NSFW, so enter at your own risk.) as their third writer. It’s pretty cool as I’ve been a fan of Hatefarm, and Mall Monkeys before it,for forever. So to finally be working together with Eric and Rob is pretty cool. I’m looking forward to being a good little hatefarmhand. I think a comic I wrote is going to be the next one. So what does that mean for ARG? Absolutely nothing. ARG isn’t changing. I’m just a writer over there. It’s basically a collaborative challenge I’m looking forward to. In other other news. I’m also going to be writing and drawing a short comic story for an Anthology book that will come out late this year. I’m excited because it gives me an opportunity to explore long form comicking more (similar to Aurora). So it’ll be a busy year, but it’s all under control for now. great. now im curious about the spork boots. man, you guys make me want to play Dungeons and Dragons. Its a shame i’ve never actually seen a set or board or whatever its called in real life. I was never able to get into DnD. Which severely damages my Nerd cred, I could never get into the whole role-playing aspect of it…which is to say everything. Always enjoy watching my buddies play though, so I would enjoy hearing some of your stuff. I suppose I’d better re-bookmark hatefarm since it’s about to get better. Why did she have to lift her dress up over her knees to show them off? I really hope someone cosplays this. 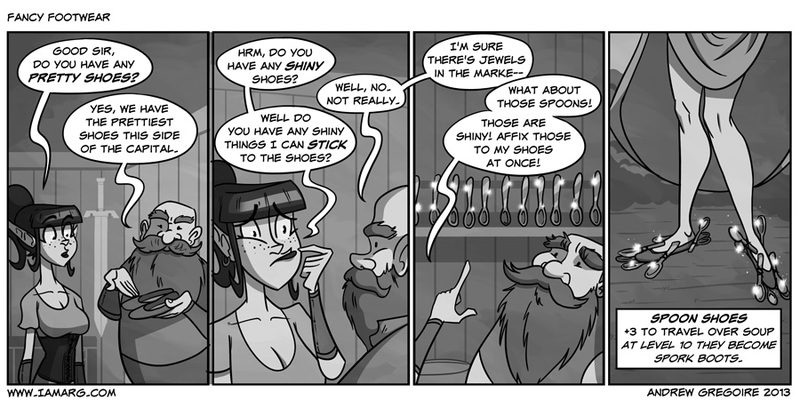 What bonuses do Spork Boots give ya? Also Knife Gloves give you +10 stab. It’s good to keep busy, especially if you’re doing what you love! Now you just need to work in a soup-moat somewhere to really let that wise investment shine. OH MY GOD YES. SPORK BOOTS. YES.